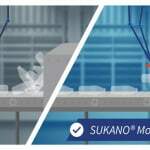 Sukano, a global leader in the development and production of additive and color masterbatches and compounds for polyester and specialty resins, announces the launch of a new mobility aid additive masterbatch for Injection Stretch Blow Molded (ISBM) PET bottles. This new additive masterbatch allows bottle makers and brand owners to run their conveyor-belt systems and production robots without the need for a spray coating. Bottles must rotate freely as they pass through the production conveyor, as forced rotation caused by friction can lead to a blockage on the line. The new Sukano Mobility Aid solution, believed to be the first commercially available for this application, is provided as a solid PET masterbatch that is blended with virgin PET or RPET material during molding or processing. Even at low concentrations, the masterbatch disperses consistently through the PET material, reducing its coefficient of friction (COF), and modifying the surface texture with a microstructure. 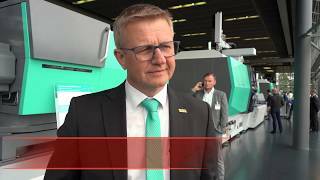 Sukano is currently assisting a customer in the U.S. optimize its production process. "Our customer, a key and leading global player in the consumer goods industry, reported that PET bottle mispicks by their production robot decreased sixfold when using our Sukano Mobility Aid masterbatch," stated John Price, director of technology and operations in the U.S. The consistency and even distribution of the masterbatch lead to improved performance. The additive masterbatch preserves secondary processing steps that require adhesion, like labelling and printing. It also helps eliminate the cost and cleaning requirements associated with spray coatings, which leave a waxy residue on bottles and packaging equipment that must be removed through regular cleaning. Additionally, the Sukano Mobility Aid masterbatch avoids the potential risk of microbiological contaminations of bottle surfaces by aqueous-based coatings, which may require additional additives or application in a clean-room environment. "Sukano Mobility Aid offers a valuable and safe alternative for bottle makers who, until now, have had to apply spray coatings to PET preforms and bottles to manage the production problems associated with ISBM production," said Michael Kirch, global head of R&D. Circularity as a decisive design criterion to Sukano’s products placed in the market PET recyclability is essential in an increasingly environmentally conscious world - and Sukano's innovative mobility aid makes no compromises in this area, as it is formulated according to the European PET Bottle Platform (EPBP) guidelines. 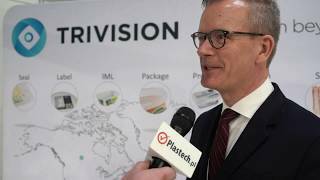 These enable the industry to innovate and bring new PET bottle packaging solutions to the market without disrupting the existing clear PET recycling value chain, with special focus on bottle-to-bottle recycling.